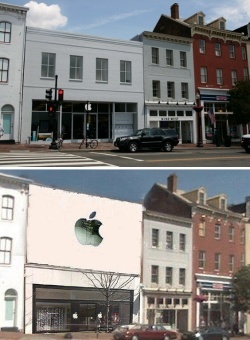 In June, the technology giant Apple finally opened its first store in the Georgetown neighborhood of Washington, D.C. The grand opening is the culmination of a saga stretching back two and one half years to when Apple bought a building that formerly housed a women's clothing store. It took Apple eight months to build its new store, but it took them more than twice as long to get design approval (19 months) for the new building which replaced the former clothing store. Top, the Apple Store in the Georgetown neighborhood of Washington, D.C. as built. Below, the initially proposed design. The protracted design review process began when Apple proposed their standard (off-the shelf), modern façade (they are, after all, a high-tech company) that they use in suburban stores all over the country. The Georgetown Design Review Board balked at this and reaped a heap of criticism for letting historic preservation stand in the way of retail progress. The new building, which is now complete, looks pretty much like dozens of other historic commercial structures that line Georgetown main commercial thoroughfares. Some may think the façade is bland. Others will say it fits right in. Whatever you think, one of the things the new design proves is that when a chain store developer comes to town it generally has at least three designs (A, B, or C) ranging from Anywhere USA to Unique (i.e., sensitive to local character). According to retail consultant, Bob Gibbs, "which one gets built depends heavily upon how much push back the company gets from local residents and officials about design and its importance." While the Apple store owners were no doubt frustrated by the community's demands and the design review process, they will assuredly do very well in their Georgetown location. As local blogger, Topher Matthews said, "most simply won't notice the building's architecture at all and will instead hone in on the toys inside." Georgetown is the one of the single best retail locations in the nation. Why? Because, the historic neighborhood is one-of-a kind. It is charming, walkable, and filled with tech savvy young adults. Georgetown is the kind of neighborhood that provides "a place making dividend." This simply means that people will stay longer, spend more money, and come back more often to places that attract their affection. We sometimes forget that every building has a site, every site has a neighborhood, and every neighborhood is part of a community. Georgetown is a successful retail location primarily because it has a unique sense of place.What would happen to the Georgetown's of the world if every chain store operator could build their standard, off-the-shelf building? Georgetown would simply cease to be a special place. It would lose its place-making dividend. Ed McMahon is one of the country's most incisive analysts of planning and land use issues and trends. He holds the Charles Fraser Chair on Sustainable Development and is a Senior Resident Fellow at the Urban Land Institute in Washington, DC. 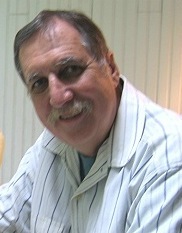 McMahon is a frequent speaker at conferences on planning and land development. Over the past 21 years, we've been pleased to have published more than two dozen articles by McMahon in the Planning Commissioners Journal, and now on PlannersWeb.com.